I haven’t told many people, and I didn’t want to for a while. It was a secret I wanted to hold close. And people don’t talk much about these things anyway. I had a miscarriage. Nick was home on leave for three weeks. For the second time in our marriage that I know of, I was pregnant, and we lost a baby. I thought: No. No more loss. It’s so different this time. I feel like I actually know what is going on, that I’m psychically aware. But at the same time, I am more confused. And what I’m thinking about the most is how small and mysterious our baby was. So so so small. When I was younger and miscarried, I felt impelled to name the child. Mary John. And this baby? I just don’t want to. I am always saying people grieve in different ways, but in the past I had assumed that it would be almost universally good for someone to name a lost baby. And it does good for people. It counteracts a collective silence about miscarriage. It helps us name not only our children, but our grief. But right now, at least for the time being, I have a confusing relationship with this child we have lost. I feel like she’s so mysterious that I can’t claim her with a name. I can’t claim her actuality or potentiality or pretend like she is really mine. This is what I’m feeling. I don’t like it. I want to feel sure about her, to embrace her and call her mine. That’s what hurts. She’s not mine. Children never are, whether they are born alive or die early like uncut gems buried in the earth. Whether they are biological or adopted, whether they are close to you or independent. Our joy, our great sacrifice, what we cannot help but do, is to love them anyhow. We don’t talk about miscarriage enough. I have so many family and friends who have lost babies, and many of those people have told me they feel they can’t talk about miscarriage as a “real” loss. If you’re someone who never grieved a miscarriage because you didn’t have time, or didn’t have anyone to talk to, or thought that you didn’t have the right to grieve, let yourself be sad. Find some way to think about and commemorate your loss and your child. Write about it here, tell a friend, join a support group, pray about it, write it in your journal, or talk about it with your spouse. Take time to grieve, no matter how long it’s been. Part of our story is below. There was only one time in the past eight years I knew for sure I was pregnant. I was barely twenty-two, married seven weeks, and I was five weeks pregnant. The one child ever conceived in my body made her appearance in the first two months of my marriage. The morning the bleeding started we had a class to attend. But the professor had said he didn’t care if we missed two classes; it was the third that would earn us a warning. I remember his words and even the inflection of his voice: You can go see the Pope, you can go to a baseball game, you can sleep in for all I care. I don’t even want to know. So my husband went to class while I stayed home. I sat in our apartment for a while, thinking not of the baby but just feeling the hyper-reality of my skin and my body, the concentrated feeling of skin and body and blood. Then I walked to campus and went to the chapel, a cold brown church I loved to sit in. I lay down on the stone floor and touched the cold with my hand, felt the embrace of the cavelike walls. I walked up a path to the building where the class was to wait for Nick. 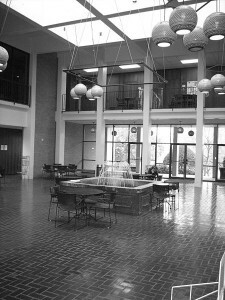 There is an atrium in that building–a simple fountain in the middle. A collection of wrought iron tables and chairs around it. When Nick came out, he sat down with me while I cried in this atrium. I remember the sound of the water. I remember his face. And I remember our professor walking out from a hallway, looking at us, then going across the way to the registrar’s office. He emerged with a yellow slip of paper, waved it in my direction, then left the building. It was a silly slip warning me I had missed two classes and was “in danger of failing.” I found it in my mailbox a week later. And for the life of me I can’t let that go. The promise that he didn’t care if we missed two classes. Then this carbon copied paper waved in my face and delivered to the mail room. The sadness of it seems to strike me almost more now than it did then. Removed from the visceral pain, I see myself as a character who deserves pity and love. Caught skipping a lecture because it seemed like the right thing. An observance, the smallest thing I could do for that disappearing child of my youth. And then this professor waving a piece of paper in my face. The black wrought iron, the beautiful fountain, the sun through the skylight, the yellow slip of paper. When I remember the feeling of these things, I know I never forgave him. He: a bad day, annoyed with a student who appeared to be flaunting her absence by sitting outside his classroom. Me: iron, water, sun, child. Gone.